Inanimate Alice is a transmedia narrative (‘born digital’) incorporating text, sound effects, interactive gaming, and visual stimulus through drawing, painting, puzzles, photos and digital graphics/photography. It is multi-sensory. The story itself is told through the eyes of Alice, who is 8 years old when she begins her story. She is a budding game designer and developer that lives in many cities around the world before settling in ‘Hometown’ when she is 13. Subsequent episodes since 2005 have seen Alice grow up and in the latest episode (no. 5), she is 16. The audience for this narrative is the “tween” age group (approximately 8-12yrs) in early chapters, but as Alice grows older, her story appeals to older teens. The beauty of this serial narrative is that, similar to the print series of Harry Potter, the protagonist is aging with her audience – an excellent way to guarantee a readership. The sophistication of the narrative’s graphics, interactive affordances, and general presentation has also developed and “grown” over the 10 years since Inanimate Alice started. The latest instalment uses Unity Web Player, allowing for sharper 3D graphics (but restricting users with outdated browsers that won’t allow the plug-in). Since its inception in 2005, Inanimate Alice has moved into the education sphere, providing alignment with a number of Australian Curriculum areas (The Arts (ACARA, 2015a), Media arts (ACARA, 2015d), English (ACARA, 2015b)), and the Information and Communication Technology (ICT) capability (ACARA, 2015c). Specifically, Inanimate Alice also supports a number of literacies, including digital literacy, social and emotional literacy, STEM literacy for girls in particular (TMC, 2015), visual literacy, and multimodal literacy (O’Brien, n.d.). Within Australia, Scootle is the sole repository for Inanimate Alice curriculum support documents (Boyd, 2014). The beauty of Inanimate Alice is that is so well written and was made to be used in education in a number of different subject areas, and as an exemplar to students who want to understand and create their own digital narratives. Inanimate Alice starts with a simple on-screen narrative in Episode 1, as Alice begins her journey forward as a game designer. As she grows in age and in skills, the episodes increase in their interactivity and gaming capacity. Jenkins (2010), in his blog post on principles of transmedia education revisited, speaks about multiplicity (multiple endings) and seriality (as the word suggests, a serial narrative). This transmedia narrative allows for multiple endings (like the old ‘Choose your own adventure’ books) in Episode 3, where the success of Alice and her family making it through the checkpoint relies on the reader successfully collecting all the babushka dolls while following the narrative. Readers will be sticking around to see how Alice develops in her skills and what happens to her and her family at the end of the promised 10 episodes. Not all interactivity is initially made obvious to the reader. It can take some random clicking around the screen to find out how to collect a doll or move to another part of the game (as in Episode 4 when Alice is lost in the building). The beauty of the affordances of later episodes of Inanimate Alice is that it allows the reader to either purely engage in the reading, or interact with the narrative by undertaking the gaming challenges of the particular episode. From an educational point of view, a great way to appeal to those who are good at sustained reading, and also to draw in those who are not such great readers but can still take part in the story through their ‘hands on’ option. Feedback and / or adaption using Inanimate Alice is evident in the way that schools around the world are engaging with the narrative. Alice’s story can now be read in 6 or 7 different languages (depending on the episode). The Bradfield Company is expanding on Alice’s world by providing augmentations of Japanese and Indonesian translations, with learning resources, via the Languages Learning Space website. A clue to the difference between this and eBooks is the fact that users move through ‘episodes’ rather than ‘chapters’. Already, this will capture the attention of the targeted age group. It hints at something more cinematic and ongoing, something with no obvious ending in sight, the immersive qualities found in film. The interactive gaming appeals to those who enjoy participating in the environment, and for those who love the central characters, there is the mystery of the narrative itself. 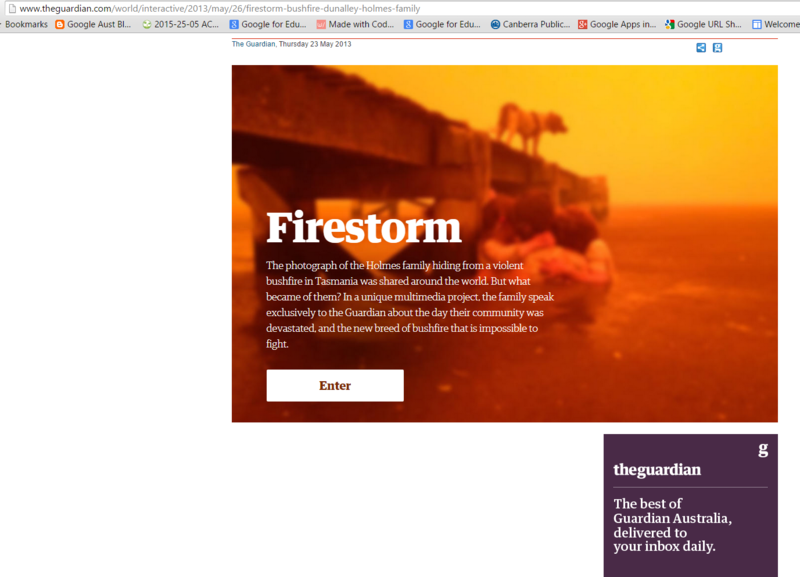 Firestorm is a non-fiction multimedia news report and tells the story of the Holmes family of Dunalley and their experience of the devastating Tasmanian bushfires of January 2013. Many remember viewing the small town of Dunalley on news bulletins at the time being engulfed by flame, and being horrified at the thought that the townspeoples’ only hope was to head for the water. This exceptional piece of journalism was created for The Guardian by Jon Henley as the writer and his team of interactive developers and multimedia producers. No longer is newspaper journalism in the digital realm the work of a journo and a photographer alone. It combines video footage and images from Dunalley firefighters, small business owners, and the Holmes family themselves, interviews, and an audio soundscape of music and sounds from the event. The story is available to experience through six chapters. These are best viewed chronologically, however, the reader can also skip through each chapter from the menu on the right hand side of the screen. Personal interviews cascade over powerful images which in turn is supported by appropriate audio. Well edited footage and interviews means that the story is kept tightly to the events that took place, interspersed with scientific facts and figures about the nature of bushfires in Australia and the effects of global warming on our country and how we live in the landscape. At no point does the reader feel lost or confused, and it is easy enough to go back and revisit any particular piece of the story. The juxtaposition of professional and personal footage (from a firefighter in the street, to images taken by the Holmes family to let their daughter know they were still alive) makes for a powerful and emotional piece of journalism. The horror of what the family went through is palpable as the reader moves through the narrative, the different media types well placed to elicit these strong feelings and make a difference (Jorstad, 2013). It moves beyond sensational print and TV journalism and sticks to the facts to create a true sense of the events leading up to, during, and after this catastrophic event. Firestorm can be used in a number of curriculum areas. It would be a particularly powerful piece to share with a Science class studying the effects of global warming, perhaps providing a springboard to further discussion and reading in this area where a traditional textbook interpretation may not enthuse. This narrative lends itself to developing the general capability of critical and creative thinking, in particular “critically analysing independently sourced information to determine bias and reliability” (ACARA, 2015e). The designers of this narrative piece utilised the colour palette well throughout, ensuring that text was not lost on dark background, and that text was still visible with images playing in the background. The colour palette itself echoed the landscape upon which the event took place, adding to the holistic approach taken in this narrative. The narrative was able to be viewed on a desktop computer screen, a mobile phone, and a tablet, just as any other traditional newspaper would be. In fact, the tablet version also includes six short films, that “bonus” that has come to be expected with apps and interactive media. Something that was an issue was that it wasn’t immediately evident that the text on the side of the screen was able to be scrolled through. This may cause difficulty to the reader. This piece can be shown in parts to class groups and analysed but is unable to be separated out into specific types of media ie video, audio, still images, interviews. There is no ability to further manipulate these at all. While some may compare Firestorm to a documentary or a piece of TV journalism reminiscent of 60 Minutes, it goes far beyond that. It compels the reader to continue on to the end not with sensationalism but with something lacking in today’s society: a well considered factual piece that educates and provokes further thought around our place in the landscape and how we manage it. The digital affordances used throughout requires the reader to engage deeply with the content, more so than a regular print newspaper does. To allow further discussion of the matter with others, there is the ability to share this piece using social media channels that most people readily engage in on a regular basis: Facebook and Twitter, via the ‘Share’ button in the menu bar on the side. For those interested in knowing more about the 2013 Tasmanian bushfires, there is also the opportunity to purchase the eBook of the events with the unabridged narrative by Jon Henley. This title first appeared as an animated short film, the story by William Joyce winning an Academy Award in 2012. The picture book of the film came out in June 2012. It was Joyce’s own Moonbot Studios that then took the picture book into the digital realm and an app was born. Young children have grown up with a ‘talking book’ since the days of a book that came with a small record, a bell indicating when to turn a page. That record has since been replaced by a cassette, then a CD, and now an app on an iPad or other portable device. The platform has changed to allow children to interact with their story in a way that was unimaginable in the recent past. Take for instance, the young child who couldn’t understand why her magazine page couldn’t be pinched or tapped for interactivity (UserExperiencesWorks, 2011). There is an expectation from a young age that everything has “bells and smells”. But the question to ask for this particular book is what affordances the digital version offers that enhance and extend the print book (Yokota and Teale, 2014). In their article, Yokota and Teale discuss this and other questions around the advent of apps in early childhood literacy education, and provide educators with some particularly insightful criteria to evaluate quality digital texts in the early years. This app, like the print book, is rich in colour and detail to draw the reader into the story. The digital affordances in this title allow young children to practice their fine motor skills in repairing a book or doing a puzzle, pinching and dragging items across the screen. They are able to hear the words in the story and follow along, and then try to read aloud themselves. It is even an opportunity to develop some musical literacy by playing along with the music notation on the screen on the keyboard provided. The easy to access menu allows control over narration and text, music and language, making it very user friendly. Social and emotional literacy can be explored with this app, as children watch the metaphor of books lighting up peoples lives, with a transition from black and white to colour as Morris hands out books to others (Ritter, 2012). Having used this with a senior secondary English class, the class in groups comparing this and other picture books and their apps and considering the question of which would be more appropriate for early childhood literacy, their answer was that the book would always come first. They felt that while the app was particularly engaging in allowing children to participate by playing the piano, repair a book alongside Morris, and fly through words, these were all distractions away from the story. They didn’t really allow the child to immerse themselves in the actual emotional build-up of the words that reading the picture book could do. An intriguing observation from a generation that is supposed to treasure the interactive over the static. As another comparison exercise, Media students could easily compare the animated film against the book and the app. The app itself is almost a cinematic experience. While the app offers the user lots of interactivity, there seems to be a loss of engagement with the actual story that is gained from reading the picture book (which seems to echo the findings of the English class). 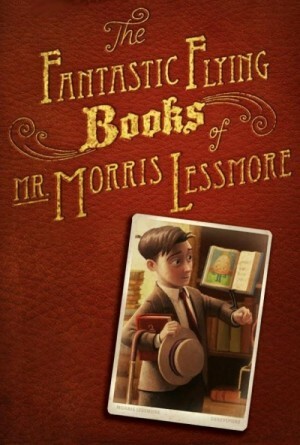 When reading the picture book to two young boys (aged 7 and 8 at the time), the elder child cried at the end of the story when it was obvious that Morris Lessmore’s leaving meant he’d come t the end of his life. When he then engaged in using the app, he was so distracted by all the activities and the aforementioned ‘bells and smells’ that he didn’t have the same reaction. What makes a good digital text, what counts as one, and what purpose do they serve? A digital text is one that incorporates affordances from the digital world (such as access to hypertext and visual enhancements) alongside “works of important literary aspects” (Electronic Literature Organisation, 2015). These texts immerse the reader in a sensory experience that is not the same as purely print literature (Jabr, 2013). These works are not bound between pages and covers (Pettitt, 2010) and take the reader into the digital ecosystem to interact and sometimes create new meanings and experiences within and from their chosen piece of digital literature. Sadokierski (2013) discusses the digital text as one that allows the reader to encounter audio visual and interactive elements that can’t be experienced through a print text (particularly useful in a non-fiction text such as a science textbook). A digital text can be anything from a digitised print book, to an enhanced eBook, to “born digital” transmedia literature, such as Inanimate Alice (Pullinger and Joseph, 2015). Reading digital content is still not my mode of choice. I am still wedded to the “pBook” (Sadokierski, 2013) for my leisure reading, but have had to embrace reading online via my desktop for CSU marking work, professional reading via Facebook and Twitter, and academic reading for the MEdKNDI. Jabr’s (2013) findings about the tactile nature of print text more strongly embedding information resonates with me. Digital text distracts me and I don’t find I retain information as well unless I’m also taking notes, something I don’t find the need to do with print. I have found, however, that since making the commitment to be fully digital with this particular degree, I am enjoying the affordances that digital text has given me. Being able to take advantage of hypertext within articles has led to further findings in a particular area of interest. The ability to immediately clip and tag these articles to file within Evernote as they are found has allowed me to make linkages between my learning that was not previously possible (as touched upon in Cull’s (2011) article). I really enjoyed Inanimate Alice. It started slowly for me but then became addictive and gripping. I actually remember when it was first published but never really took an interest until this session. I enjoy the interactivity of the narrative and am also a fan of a good mystery! While this narrative has been classified as a transmedia narrative, I’m still figuring out whether this is a book or something more. When does a book move to being a film or a documentary? Is this form of literature paratext, or technotext, as suggested in Toppo’s article (2015)? The graphics intrigue me and I can see so many applications for an art class, a graphic design class, and a photography class. Analysis of differing techniques, rendering, colour, shading…and I’m not a visual arts teacher. I would love to share it with a Childrens Literature class but our school is phasing this out because of Australian Curriculum requirements (doesn’t fit within the Senior Secondary English course). However, the Australian Curriculum – Senior Secondary – English allows for “visual elements combine with spoken and written elements to create meaning”, and one of the content descriptors is “evaluating the choice of mode and medium in shaping the response of audiences, including digital texts. (ACEEN003)” (ACARA, 2015b, Timbrell, 2015). Inanimate Alice also would fit in quite well as a resource within a Media class, a Photography class, a graphic design class, and a web design class. A Music class could explore the differing use of sound effects within a transmedia narrative. Perhaps students could construct an alternate soundscape for the narrative depending on their response to the story. So many creative possibilities (Fora TV, 2013)! As a teacher librarian, I am pleased that this form of digital text takes words beyond the traditional form and makes them accessible to an audience that may be otherwise reluctant to engage with reading. Students can interact with language on a platform with which they have a familiarity (Edmondson, 2012). Edmondson, E. (2012, March). Wiki literature circles: Creating digital learning communities. English journal, high school edition, 101(4), 43-49. Lean on me: the TL supporting the school supporting the TL. Teacher librarians, school libraries, and their response to tragedy in the information age.